October 7, 2015  Three runs batted in by rookie Kyle Schwarber and a four-hit complete game thrown by Jake Arrieta get the Cubs to the Divisional Series, where they'll face longtime foes the St. Louis Cardinals. October 2, 2014  The San Francisco Giants decisively beat the Pittsburgh Pirates 8-0 in the National League wild-card game Wednesday night in Pittsburgh. 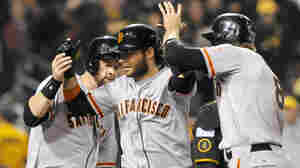 The Giants will take on the Washington Nationals on Friday.